Building My Empire One Cup Of Flour & Sugar At A Time. I have to be honest, this year..thus far the heat & humidity has been on the managable side. I am usually so incredibly miserable right now that I can not even think straight let alone want to move and baking is not on the agenda. So I recently have done a little baking enjoying it while I still can, this “late” into summer! I made a bunch of different goodies for friends and today I wanted to share this Pumpkin Roll Cake! I hope no one thinks it’s too soon for pumpkin goodies. I could bake with pumpkin, happily all year long. 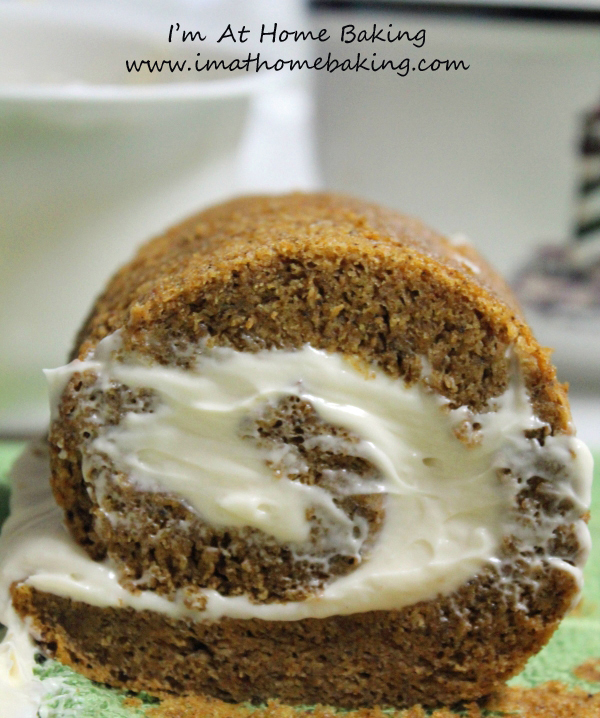 Have you made a cake roll before? I have made several over the years and they never come out exactly the same. The weather/humidity seems to play a role in how well the cake roll releases from the tea towel. This time it gave me a little trouble but with almost 100% humidity I am surprised it did not rip to bits. This cake roll is rather large and very moist! I love pumpkin anything and the smell is just amazing. You could really use any kind of filling/flavoring but cream cheese always pairs well with pumpkin. One of the keys to the success of a cake roll in my opinion is to make sure the cake has fully cooled before releasing from the tea towel but also don’t leave it so long that it has time to adhear to the tea towel. Checking the coolness is a must! Preheat oven to 375. Grease Jelly Roll pan, or cookie sheet. Combine flour, baking soda, cinnamon, cloves and salt in small bowl. Beat eggs and sugar in Large bowl until thick, then beat in Pumpkin. The mix into flour mixture. Spread evenly into pan. Bake for 15-20 minutes, cake will spring back when touched.Immediately remove cake to a towel and roll the cake inside the towl, move to cooling rack until fully cooled. Beat cream cheese, powdered sugar, butter & vanilla in small bowl until smooth. Unroll cake very gently, remove towel. Spread filling evenly over cake. Re roll the cake. Wrap in plastic wrap and refrigerate at least one hour. Sprinkle with powdered sugar if desired. Featured Recipe Of The Week!